The recent explosion of unmanned aerial systems (UAS) - or drones - on the market has caused a mix of awe and consternation in equal measures, no matter what their application. Many find them sinister, due to their military background, yet their professional use in TV and Film has been nothing short of breathtaking. Their agility, manoeuvrability and value have provided productions with more creative potential than ever before and seen drones heralded as the future of the industry, a revolution in aerial filming and the demise of the helicopter. However, a storm has blown up over safety that has threatened to prevent drones realising their full potential as a filming tool. Having been an aerial film expert for over 20 years, like many, I was initially sceptical of these new gadgets on the block, particularly the claims they would supercede helicopters. However, after watching developments in the safety and handling of the very best drone kit, I decided to take the plunge. Having found what is considered to be the best piece of equipment in the Intuitive Aerials' Aerigon, I worked with the drones on commercial projects before using them on the Marvel blockbuster Avengers - Age of Ultron. Here, my team combined Helicopter aerials with drone sequences, allowing each to complement the other. You can check out the results when the movie opens soon! Rather than a more cost-effective solution to aerial filming than helicopters, drones should instead be viewed as another tool for productions to draw upon - and a very exciting and innovative one at that. 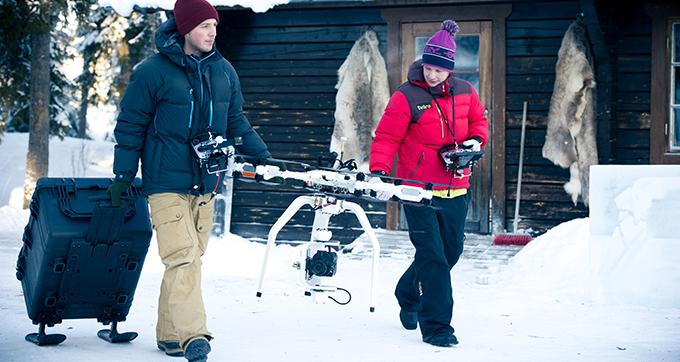 Aerial film experts know that drones are more about evolution than revolution. They are more versatile in tight spaces than helicopters, with their size and agility enabling sequences to be filmed were previously impossible. They are particularly suited to indoor filming in confined spaces and calm, controlled conditions. One example would be shooting chase sequences, such as cars racing through subways, which would not be possible to film using helicopters. This means that directors and DOPs are becoming increasingly keen to use drones because they allow them to achieve alternative and exciting shots, that would previously have required expensive, time-consuming and complex wire rigs, for example. If you're looking to invest in a drone or simply want to arm yourself with key intelligence when choosing a supplier, it's important to know those models that are best suited to filming and the most appropriate camera equipment to use with them. The best drone is really down to the one that suits your purpose best. 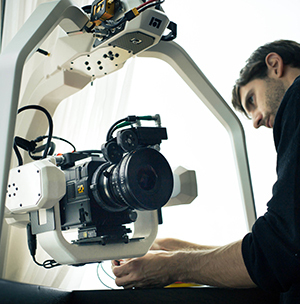 For example if you want to shoot Alexa with an Angenieux zoom and lens control, then our Aerigon is the one to use. If you only need lighter, smaller cameras with stills prime lens then there is a much wider choice. So drones are definitely helping to drive innovation in filmmaking, but for all their versatility, their size places restrictions on the types of camera and lenses they can carry. There are also issues over stabilisation making some elements of outdoor shooting a challenge, plus drones are restricted by law in the UK to operating under 400ft, and bound by an increasing number of regulations. This means they currently find it hard to match helicopters in terms of quality. The traditional mainstay of aerial filmmaking, can operate in most climatic conditions and can carry full-size camera kit along with the in-air talent to get the most out of it, so there is no compromise on equipment or expertise. In fact, it is this level of expertise that currently also puts helicopters ahead of drones. Although there is a growing drone talent pool, there remains a gulf of expertise between the two technologies. In some jurisdictions and depending on size, anyone can 'fly' a drone, whereas helicopter pilots need the required flying licence. Compounded with their remote controlled nature, this has resulted in fears over the safety of drones on set. This means that although directors and DOPs may be keen to use drones, executives are less ready to embrace them, as their starting point is "what are the legal implications"? With health and safety being of paramount concern in any TV and film production, how can you ensure that drones are used with minimum risk and to best effect? If approached in the right way, there is very little to worry about, as countless successful and exciting projects featuring drones have proved. For example, In Disney's Into the Woods, Spectral and Now You See Me - the Second Act, they are being used to spectacular effect. The answer is simple. Just as you wouldn't employ any member of your crew without the necessary expertise, only choose a drone operator who is highly skilled, not just at piloting the machine, but also in filming, and can demonstrate that they adhere to strict safety guidelines. Look for drone pilots and operating companies that are CAA or FAA Training Agency approved (in the UK this is often referred to as BNUC or RPAS approved) and have significant radio control experience. Of course, a skilled technical pilot isn't everything. A keen understanding of filming and camera positioning is as important, as is the ability to work closely with the camera operator and director. At all costs, avoid hobbyists jumping on the bandwagon to make a quick buck. In the hands of approved and licensed operators, there's no doubt that drones are a fantastic filming tool and work well alongside helicopters to create amazing aerial sequences. The key is to use them to meet the objectives of the production in tandem with other technologies and techniques, rather than for the sake of it. Think about the delivery medium - web, TV or cinema. The higher the quality, the bigger the camera and lenses, then the bigger the drone. The heavier the camera, the shorter the fly time and the less agility you get. So make sure your aerial coordinator is brought in right at the start of the production process, as these decisions can significantly influence on sequences and budget. The best thing about the Intuitive Aerial's Aerigon is that it can accommodate even the largest cameras, like Red Dragon or Arri Alexa with a proper cinema lens. However, now the Arri Alexa Mini is available, it's clear that camera and drone technology is converging, which should have a key impact on the quality of filming in future. But as ever, the choice of lens and what package a drone can fly is critical. Other key considerations remain - the weather, proximity to an airport or other sensitive areas such as an embassy, police and power stations. Plus an understanding of drone regulations and how the approval process vary between cities and countries, so need careful investigation. As to what shots are best suited to drones, there are really no rules, it's all about assessing the best tool for the job. For example, if you're shooting an actor in a window, pulling out to a wide shot in a street, a drone is more suitable than a helicopter. On Into The Woods, I used the drone for some great sequences matching from a crane shot, through trees and up to reveal the canopy beyond. Experienced and qualified aerial filming companies that have embraced drones are transforming not only film and TV productions, but also attitudes towards unmanned aerial system technology. Originally sold in as an affordable alternative to helicopter aerials, drones are delivering sequences that some productions could never have afforded without them, but working in conjunction with helicopters and other technologies and tools, not as a replacement, because they do different jobs. With the right knowledge and expertise, and the necessary guidelines and approvals in place, drones will continue to push the boundaries for filmmakers. What's more, the industry will demand more from the technology in return and drive its further development, just has it has with other innovations. And that sounds like the perfect partnership. The shot called for a match to a crane shot of the cast in a wooded clearing rising up through the branches and up and out to reveal the top of the forest canopy stretching away. Another shot approaching the woods from over firleds. Drones were used to compliment the helicopter aerials and provide lower level aerials along with VFX plate work on set. Quick set up time of the drone meant some last minute requests from the director for quick approach shots on exterior sets could be fulfilled without complicated wire rigs. Day and night VFX plates, on location reveals and interior tracking shots involving the cast travelling along a number of stairways and corridors in one shot.